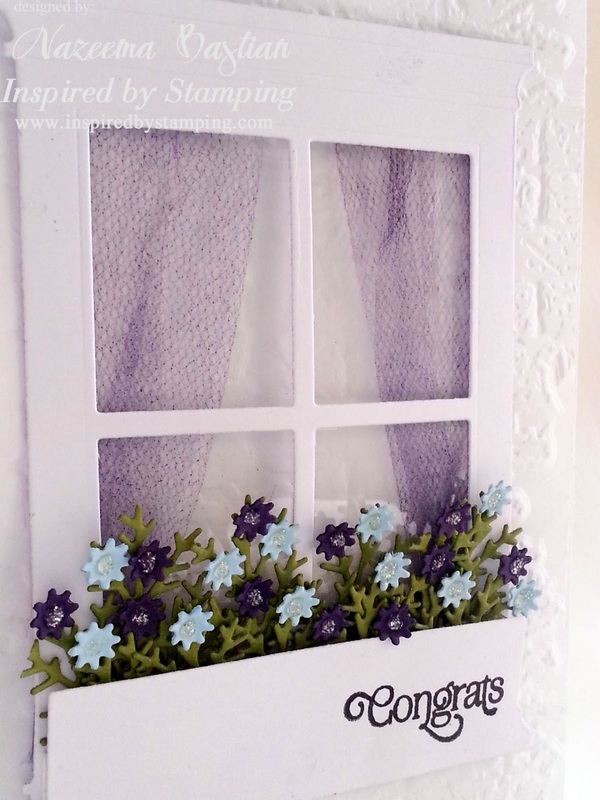 It's time for another photo inspirational challenge at Inspired by Stamping. Look at that beautiful picture!! 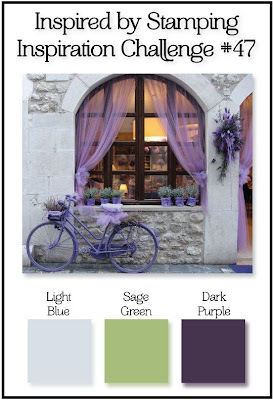 I love that purple bike and the tulle as window drapes. Once I saw the drapes I knew what I wanted to create and this is what I came up with. I used a brick embossing folder to give the card more texture. Used a number of die cuts for the window, stems and flowers. Look in the window....I colored some white tulle by rubbing the distress ink pad to give it's color. Isn't it just beautiful? It's perfect card for someone who just recently bought a house. That is why I used the "Congrats" sentiment from the Cute Circles stamp set. So join us for a chance of winning 2 Satin or Seam Binding Ribbon, winner's choice. Before I leave you today, I want to let you know of a couple of other things that's happening at Inspired By Stamping. Inspired By Stamping is also sponsoring Addicted to Stamping & More this week. So if you love creating vintage cards, please join us this week for a chance at winning $20 gift voucher to Inspired By Stamping Shop. Calypso, this is absolutely wonderful! I love this card! Oh my! 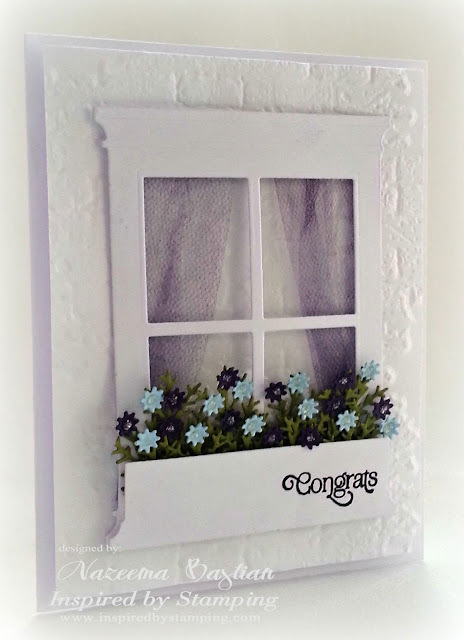 Your card is just stunning...love the window and window box full of flowers, so beautiful! That is just so clever! Great card! Beautifully done! Love your 'curtains'. :-D I'm so happy that you joined in our "Floral Fantasia" challenge at Perfect Sentiment this week, and I hope we're going to see your talent displayed here again soon. This is a fabulous card, such attention to detail. Lovely card great design, thanks for sharing at Fab'n'Funky this week. what an amazing card! I love how you created your window design. so cool! What a lovely card you made. The image is just so wonderful as are your backing papers. Thank you for joining us at Fab 'n' Funky. Gorgeous!!!!! Love your fabulous scene. The flowers are so gorgeous! Thanks for joining us at Perfect Sentiments this week. Hope to see you again. Good luck. What a pretty window scene. I love how you inked and used the tulle for the curtains.